Christine Crockett is Your South Mississauga Real Estate Resource. Whether looking through a camera lens or striving toward her goals, Christine Crockett understands that focus and attention to detail are necessary for superb quality. She carries this same level of commitment into how she approaches her clients’ South Mississauga real estate investments including Applewood Acres, Orchard Heights, Sherway and Port Credit. How to make more money when selling your home. Click here to watch CTV NEWS interview Christine on her perspective on the 2017 Real Estate market. My husband and I had been searching for our dream home in Applewood Acres for about a year and a half. The term ‘bidding war’ had become part of our regular vocabulary, and after the fourth loss, we were about ready to give up. When we saw the listing on Christine’s website for our (current) home, we gave her a call but tried not to get our hopes up. Christine and I spoke for a long time over the phone, with her asking lots of questions about what was important to us, all the while reassuring me that when the right one came along, all of the pieces would fall into place. Sure enough, we did put an offer in on our home and we could not have been more ecstatic when we got the call from Christine to say that it was ours! Throughout the process, Christine was incredibly patient and really listened to what it was that we were looking for. When it came time to put in our offer, she offered her opinion yet ultimately wanted us to be comfortable with our price, which we really appreciated. Christine was genuinely wonderful to work with, and we cannot thank her enough for helping us to get our dream home! Chistine was the right person to sell our late mother’s home. Her knowledge and expertise of the local real estate market inspired us with confidence. Her excellent marketing skills and use of the latest technology enabled a positive outcome. It was wonderful when the house sold within a week at above the asking price. It was an emotional time for us, but Christine went out of her way to accomodate our needs. Her attention to detail ensured that everything would go smoothly. We’re truly grateful to her. Hi Christine, As we are settling in to our new home, we just want to thank you for your help in the whole moving process. After 46 years of living in Applewood Acres, the decision to downsize was not easy. Over a six month period you were always available to encourage and help us, without pressure, through the details of getting our house ready for the market. We couldn’t be happier! It worked, as once listed, four days later it was sold firm, no conditions. Also, your patience in showing us countless condos and townhouses was very much appreciated. Without hesitation we will (and have) recommended you to friends and neighbours who might be considering a move. We were exceptionally happy with the service Christine provided us with. She sold our home in 8 days for 99% of the asking price. We had previously sold our house through another realtor and experienced a difficult sale with the buyers which ultimately ended up falling through. We decided to enlist Christine as our realtor because of the amazing reputation she has within the community. We were not disappointed. Christine is an enthusiastic and knowledgeable realtor who strives to produce the best possible results for her clients. She is extremely professional and conscientious. She reassured us throughout the process that we would be successful in selling our house in a timely manner and for the asking price. Due to her unwavering dedication to her clients and the task at hand, as well as the vast amount of knowledge she possesses in relation to her field, we sold our house quickly and painlessly and received multiple offers. I feel confident in recommending Christine as a listing agent. She is not only thorough, but also very easy to work with and always willing to take the time to discuss our concerns and respond immediately to our questions. 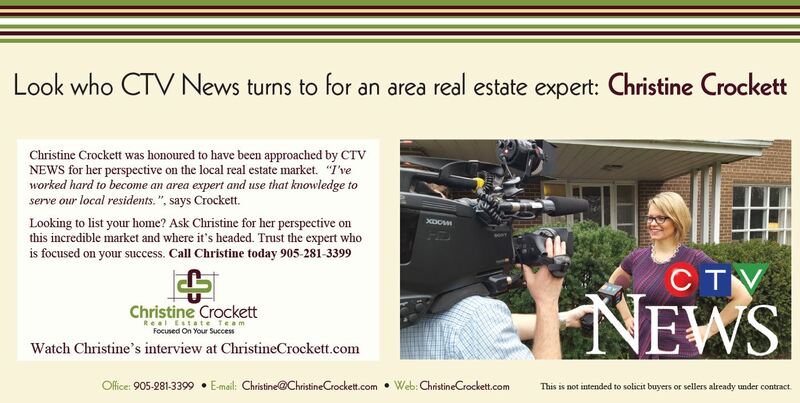 City TV interviews Christine again for her Real Estate perspective in Applewood Acres and Orchard Heights! Here on Christine’s website you will find a wealth of information regarding Applewood Acres, Orchard Heights, Sherway and Port Credit Real Estate, including homes for sale as well as pertinent information about real estate in these communities. Use Christine’s Search Feature and search for Port Credit, Applewood Acres and Orchard Heights homes currently on the market. Here on Christine’s site, you will find a one-stop resource for Applewood Acres, Orchard Heights, Sherway and Port Credit Real Estate. When it’s time to buy or sell in this area, Christine’s FOCUS is on you and your family’s best interests. From maximizing marketing strategies to her excellent negotiation skills, she ensures that every aspect is handled accurately and efficiently. Through hard work and a refined vision, she finds the angles that may otherwise go unnoticed. When you’re ready to make a move, Christine Crockett attends to every detail while staying Focused On Your Success.